Aahh, the office Christmas do! Isn’t it crazy how this one night can range from the greatest free party on a school night to the worst waste of a pre-Christmas night out with people you don’t like, and overpriced warm white wine? We’ve all been to Christmas works dos where you end up talking to Barry from accounts about next year’s IT changes, while other people seem to be having all the fun. Or there’s the crushingly tedious night with your boss telling everyone to have fun when you wish you were curled up at home with a good book. Instead of enduring another year of ghastly office Christmas Parties, why don’t you think of something a little different this year? You will still need to please most of the people most of the time, so it can’t just be a cava and manicure night if you work with a load of blokes, but how about some of these ideas instead? Although there are green shoots of recovery popping up, we’re still in cash-strapped times, so any means to cut costs while still having a good time are to be welcomed. A good way to do this is to share your Christmas party with other companies and there are plenty of organised events out there to help you. The basic concept is rather than having to hire a venue for your office Christmas party, which can be expensive and lacking in atmosphere, you can book a table, or a number of tables, at a larger event. Events companies organise the entertainment and menus, then companies book however many places they want. This is a great way to have a fancier do that your company may otherwise be able to afford, and stops that ‘eight people in the corner of a restaurant with party hats’ vibe. There is no reason why your office Christmas do has to be in the evening. In fact, it’s a terrible idea as there is so much to do in the run up to Christmas that giving up a valuable evening to eat sausage rolls with your colleagues is unlikely to engender a party mood. Far better to have a lunch party instead. If you’re a boss reading this and thinking, ‘Good grief! I am not paying my staff to have a Christmas party in office hours’, then it’s worth remembering just how much your staff will appreciate it. After all, there is usually an afternoon around Christmas when you can afford to take things a little easier, so why not kill two birds with one stone and you’ll have happy staff in the New Year. It doesn’t have to be a big, boozy affair. A simple set menu at a nice restaurant, with a glass of champagne to toast the year will be a welcome token of appreciation and will probably cost you far less than an evening do anyway. 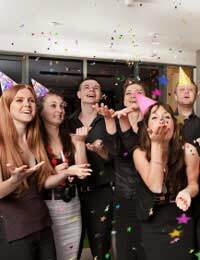 Before you yell Bah Humbug!, consider having no office Christmas party. That doesn’t mean that you don’t do anything to mark the season of goodwill, but it doesn’t have to be a party that, let’s face it, not many people want. It’s a good idea to sound it out with your employees or colleagues first, but you could suggest something completely different. What about giving each member of staff a Hamper Full Of Christmas Goodies from a nice supermarket? People are likely to be strapped for cash this year and it will be a lovely way to thank them for their hard work over a difficult year. This needn’t cost a fortune – most supermarkets sell ready-made hampers that start at around £30, which is considerably less that you’d spend organising an office party.